Scribbles In the Sand........... My Desert Diary: Hey! I´m a photographer! I´ve been putting my photos up on flickr.com for a few months now. Mainly for convenience, but also for family to see, when I was contacted by the editor of Schmap! San Diego Guide. 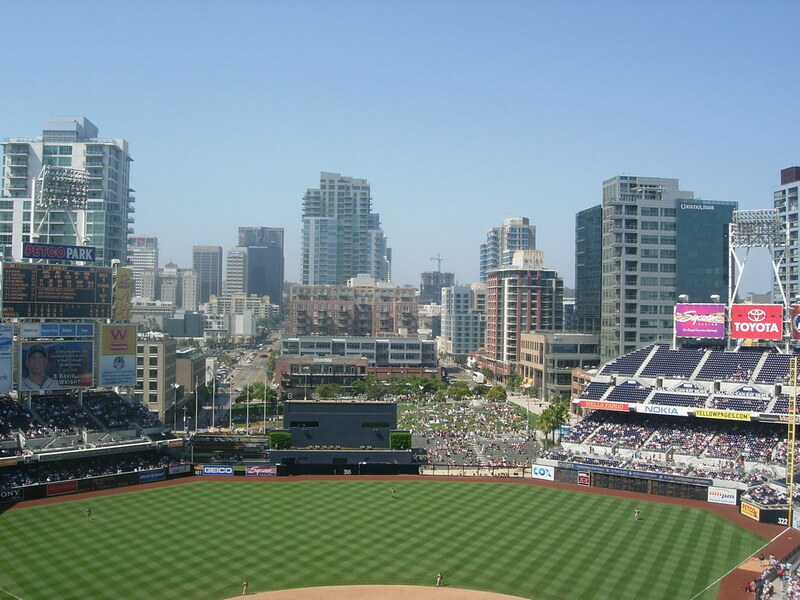 They wanted to use a photo I took of Petco stadium, from when we went to watch The Padres lose again last summer. Now this picture is in their guide! -Sunshine is guaranteed to the masses. -Animals are banned from mating publicly within 1,500 feet of a tavern, school, or place of worship. -It's against the law to use your used underwear as a dustrag. -In California you may not set a mouse trap without a hunting license. -No vehicle without a driver may exceed 60 miles per hour. -Hollywood: It is illegal to drive more than two thousand sheep down Hollywood Boulevard at one time. -Molesting butterflies can result in a $500 fine. -A city ordinance states that a $500 fine will be given to anyone who detonates a nuclear device within city limits. Quite a strange assortment of laws there.